a brand new pre-lit 9 footer we picked up last year (on a Walmart mega clearance after Christmas) - for the great room. an older 7 footer that we haven't used for 7 or 8 years - for the loft. a slender 6 footer that we did use for the last 7 or 8 years - for the foyer. Yes, you got that right. I AM going to put up ALL 3 trees. I know you're thinking I'm nuts, but this house is large enough to handle it, so I'm going to go "hog wild" (as Steve puts it). 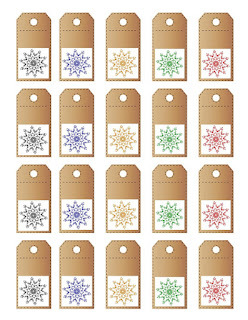 You'll be reading more about my Christmas decorating later, but I'm going to write about a little Christmas craft project today - Snowflake Gift Tags. 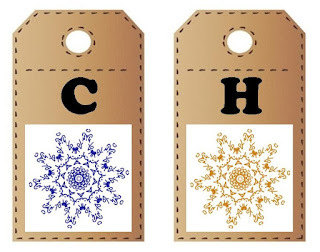 I found the free printable plain brown tags on an Internet site a while ago (can't remember where). 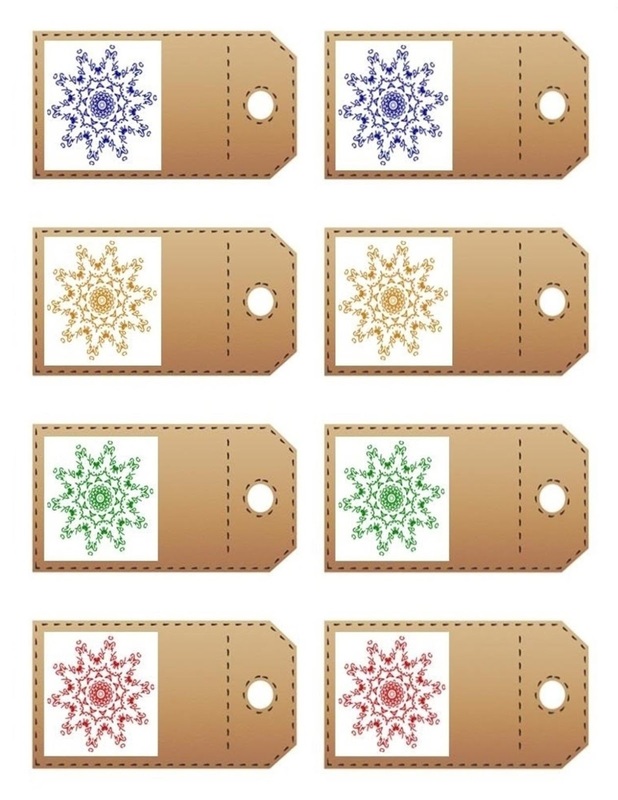 I also found the snowflake clipart on the Internet, and I changed it into snowflakes of different colors. 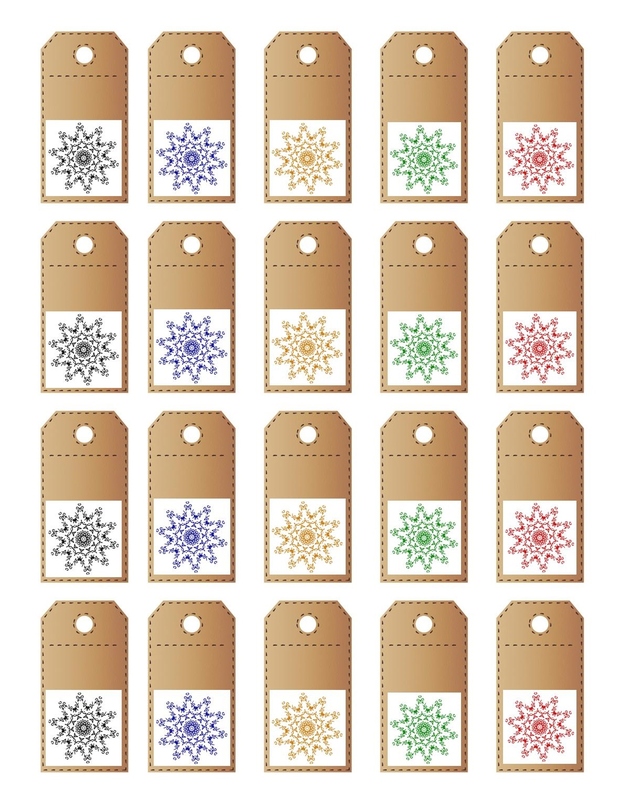 I opened up Microsoft Publisher and used both the plain tags and the snowflakes to create a new design - putting 20 tags on one page that can be printed on 8.5x11 white cardstock. It looks like this. 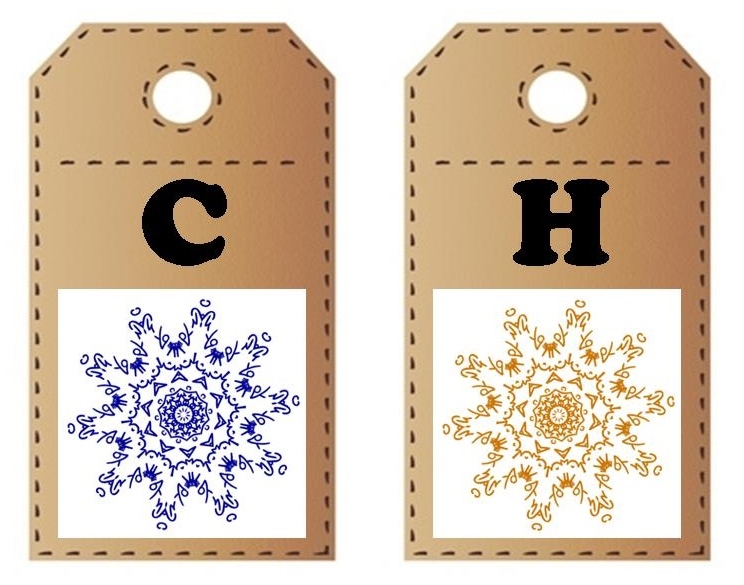 If you would like to print Christmas gift tags like these for your packages, simply click on the link below. I already did the work, so it will take you to a PDF version that you can print immediately or download to your computer before printing. 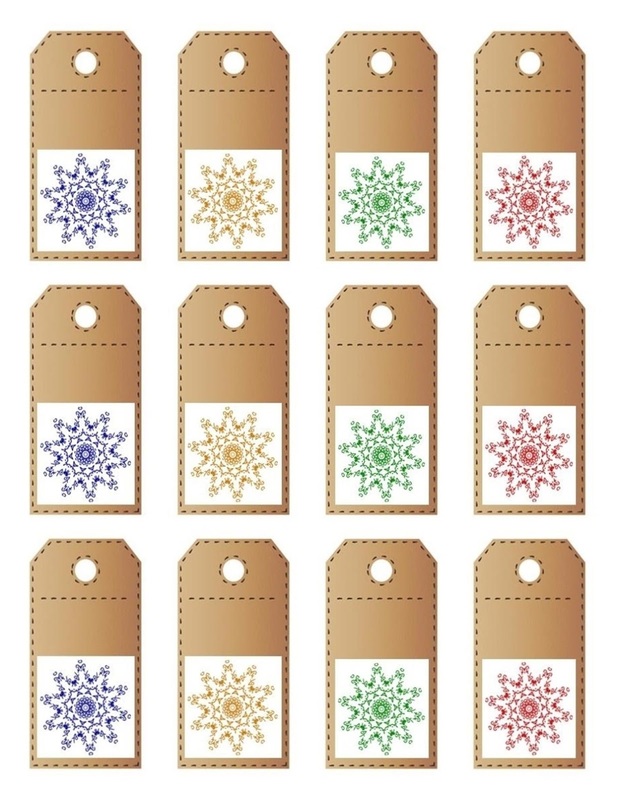 I suppose you could print them on regular white paper, but they would be a little flimsy for gift tags, so I suggest 8.5x11 cardstock. If you've never purchased cardstock, it's sold at most major retailers that sell copy paper. It should be in the same aisle. Anyway, print them, cut them out, punch the holes. . .
and add some twine or ribbon to attach them to packages. 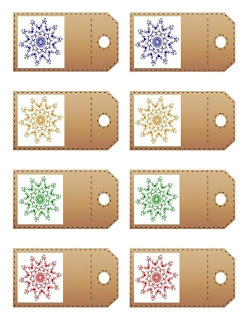 These little snowflake gift tags could even be used for ornaments on a small tree. I made the pattern in 3 different sizes, so they could also be used on a larger tree. I'm thinking about printing some larger ones on a piece of 8.5x11 laminated burlap for ornaments. Here's how they look set up for 8 per sheet. A lot of folks are hanging seasonal/holiday banners from their fireplace mantels or in windows nowadays. Each cardstock "tag" could even be glued to a slightly larger piece of burlap for a little extra oomph. Lots of possibilities here. 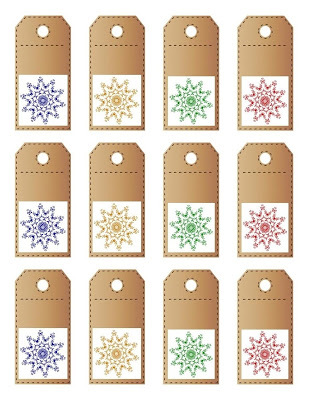 If you're not sure whether or not you want to print these, I'll have another gift tag printable later this week or early next week. These are great - thanks for sharing your work!